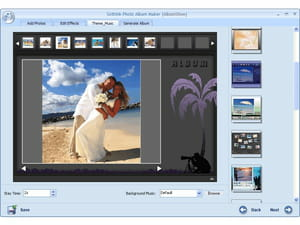 Sothink Photo Album Maker is a program for creating photo album. It comes with all the necessary features and is simple to handle thanks to its nice and clear interface. Creation: this program allows users to import photos of their choices on the main interface to design a photo album or slideshow. Importing them can be done by a simple drag-and-drop of the mouse. The order of appearance of pictures can be arranged. Transition effects: for creating a more original photo album, Sothink Photo Album Maker has been integrated with lots of transition effects that bring more fun to slideshows. It offers more than 100 items to obtain a vivid and dynamic album. Editor: some functions for image editing has also been integrated to this program with an aim to enhance the output. For example, the user can crop, rotate and remove red eyes from an image. It also enables to adjust saturation and brightness. Audio: apart from the ability to add text and pictures to the album, Sothink Photo Album Maker also makes it possible to add background sound. It supports MP3 file format as audio file. Sothink Photo Album Maker is entirely free. It is simple to install and uninstall. It includes templates that can help in this case. It offers an option to share the output on Web. Latest update on August 20, 2014 at 09:14 AM.